This article is about former territory east of the Oder–Neisse Line. For the parts of modern Germany that formerly made up East Germany, see New states of Germany. 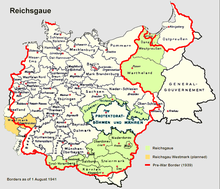 The former eastern territories of Germany (German: Ehemalige deutsche Ostgebiete) are those provinces or regions east of the current eastern border of Germany (the Oder–Neisse line) which were lost by Germany after World War I and then World War II. The territories lost by Germany following World War I included areas with predominantly ethnically Polish population, especially the Province of Posen, most of the province of West Prussia (see the Polish Corridor), and East Upper Silesia. Further territories lost after World War II include East Prussia, Farther Pomerania, Neumark, West Upper Silesia, and almost all of Lower Silesia (except for a small area east of and around Hoyerswerda). All territories lost in both World Wars account for 33% of the former German Empire, while land ceded by Germany after World War II constituted roughly 25% of its pre-war Weimar territory. In present-day Germany, the term usually refers only to the territories lost in World War II. Territories acquired from Germany after World War II were called (by Poland) the "Recovered Territories". These territories had been ruled as part of Poland by the Piast dynasty in the High Middle Ages, with the exception of East Prussia which was inhabited by Old Prussians, and had become predominately German over the centuries. The German population of the territories that had not fled was expelled, forming the bulk of the Germans expelled from Eastern Europe. The post-war border between Germany and Poland along the Oder–Neisse line was formally recognized by East Germany in 1950 by the Treaty of Zgorzelec, under pressure from Stalin. In 1952, recognition of the Oder–Neisse line as a permanent boundary was one of Stalin's conditions for the Soviet Union to agree to a reunification of Germany (see Stalin Note). The offer was rejected by West German Chancellor Konrad Adenauer. The official West German government position on the status of former eastern territories of Germany east of the Oder and Neisse rivers was that the areas were "temporarily under Polish [or Soviet] administration." In 1970, West Germany recognised the line as a de facto boundary in the Treaty of Warsaw. In 1990, as part of the reunification of Germany, West Germany accepted clauses in the Treaty on the Final Settlement With Respect to Germany whereby Germany renounced all claims to territory east of the Oder–Neisse line. Germany's recognition of the Oder–Neisse line as the border was formalised by the re-united Germany in the German–Polish Border Treaty on November 14, 1990; and by the repeal of Article 23 of the Basic Law for the Federal Republic of Germany under which German states outside the Federal Republic could formerly apply for admission. With this repeal the post-1990 boundaries of Germany are closed to further expansion. In the Potsdam Agreement the description of the territories transferred is "The former German territories east of the Oder–Neisse line", and permutations on this description are the most commonly used to describe any former territories of Germany east of the Oder–Neisse line. The name East Germany, a political term, used to be the common colloquial English name for the German Democratic Republic (GDR), and mirrored the common colloquial English term for the other German state of West Germany. When focusing on the period before World War II, "eastern Germany" is used to describe all the territories east of the Elbe (East Elbia), as reflected in the works of sociologist Max Weber and political theorist Carl Schmitt, but because of the border changes in the 20th century, after World War II the term "East Germany" and eastern Germany in English has meant the territory of the German Democratic Republic. In German there is only one usual term, Ostdeutschland, meaning East Germany or Eastern Germany. The rather ambiguous German term never gained prevailing use for the GDR as did the English term. Since reunification, Ostdeutschland has been used to denote the post-war and the respective five states of the reunited Germany. However, because people and institutions in the states traditionally considered as Middle Germany, like the three southern new states Saxony-Anhalt, the Free State of Saxony and the Free State of Thuringia, still use the term Middle Germany when referring to their area and its institutions, the term Ostdeutschland is still ambiguous. As various Germanic tribes settled in the region of central Europe, to the east several different West Slavic tribes inhabited most of the area of present-day Poland from the 6th century. Duke Mieszko I of the Polans, from his stronghold in the Gniezno area, united various neighboring tribes in the second half of the 10th century, forming the first Polish state and becoming the first historically recorded Piast duke. His realm bordered German state, and control over the borderlands would shift back and forth between the two polities over the centuries to come. Mieszko's son and successor, Duke Bolesław I Chrobry, upon the 1018 Peace of Bautzen expanded the southern part of the realm, but lost control over the lands of Western Pomerania on the Baltic coast. After pagan revolts and a Bohemian invasion in the 1030s, Duke Casimir I the Restorer (reigned 1040-1058) again united most of the former Piast realm, including Silesia and Lubusz Land on both sides of the middle Oder River, but without Western Pomerania, which became part of the Polish state again under Bolesław III Wrymouth from 1116 until 1121, when the noble House of Griffins established the Duchy of Pomerania. On Bolesław's death in 1138, Poland for almost 200 years was subjected to fragmentation, being ruled by Bolesław's sons and by their successors, who were often in conflict with each other. Władysław I the Elbow-high, crowned king of Poland in 1320, achieved partial reunification, although the Silesian and Masovian duchies remained independent Piast holdings. In the course of the 12th to 14th centuries, Germanic, Dutch and Flemish settlers moved into East Central and Eastern Europe in a migration process known as the Ostsiedlung. In Pomerania, Brandenburg, East Prussia and Silesia, the former West Slav (Polabian Slavs and Poles) or Balt population became minorities in the course of the following centuries, although substantial numbers of the original inhabitants remained in areas such as Upper Silesia. In Greater Poland and in Eastern Pomerania (Pomerelia), German settlers formed a minority. Some of the territories (such as Pomerelia and Masovia) reunited with Poland during the 15th and 16th centuries. Others became more firmly incorporated into German polities. The Pomeranian parts of the former eastern territories of Germany had been under Polish rule several times from the late 10th century on, when Mieszko I acquired at least significant parts of them. Mieszko's son Bolesław I established a bishopric in the Kołobrzeg area in 1000–1005/07, before the area was lost again to German states. Despite further attempts by Polish dukes to again control the Pomeranian tribes, this was only partly achieved by Bolesław III in several campaigns lasting from 1116 to 1121. Successful Christian missions ensued in 1124 and 1128; however, by the time of Bolesław's death in 1138, most of West Pomerania (the Griffin-ruled areas) was no longer controlled by Poland. Over the following centuries the area was largely Germanized, although a small Slavic or Polish minority remained. At the turn of the 20th century there lived only about 14,200 persons of Polish mother-tongue in the Province of Pomerania (in the east of Farther Pomerania in the vicinity of the border with West Prussia), and 300 persons using the Kashubian language (at the Leba Lake and the Garde Lake), the total population of the province consisting of almost 1.7 million inhabitants. The medieval Lubusz Land on both sides of the Oder River up to the Spree in the west, including Lubusz (Lebus) itself, also formed part of Mieszko's realm. Poland lost Lubusz when the Silesian duke Bolesław II Rogatka sold it to the Ascanian margraves of Brandenburg in 1248. Brandenburg also acquired the castellany of Santok from Duke Przemysł I of Greater Poland and made it the nucleus of their Neumark ("New March") region. The Bishopric of Lebus remained a suffragan of the Archdiocese of Gniezno until 1424, when it passed under the jurisdiction of the Archbishopric of Magdeburg. The present-day Polish Lubusz Voivodeship comprises most of the former Brandenburgian Neumark territory east of the Oder. A portion of the former eastern territo east of the Lubusz Land had previously formed the western parts of the Polish provinces of Pomerelia and Greater Poland (Polonia Maior), being lost to Prussia in the First Partition (the Pomerelian parts) and the Second Partition (the remainder). During Napoleonic times the Greater Poland territories formed part of the Duchy of Warsaw, but after the Congress of Vienna Prussia reclaimed them as part of the Grand Duchy of Posen (Poznań), later Province of Posen. 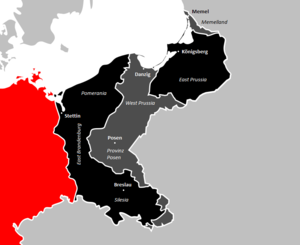 After World War I, those parts of the former Province of Posen and of West Prussia that were not restored as part of the Second Polish Republic were administered as Grenzmark Posen-Westpreußen (the German Province of Posen–West Prussia) until 1939. Piast dukes continued to rule Silesia following the 12th-century fragmentation of Poland. The Silesian Piasts retained power in most of the region until the early 16th century, the last (George William, duke of Legnica) dying in 1675. The first German colonists arrived in the late 12th century, and large-scale German settlement started in the early 13th century during the reign of Henry I (Duke of Silesia from 1201 to 1238). After the era of German colonisation, the Polish language still predominated in Upper Silesia and in parts of Lower and Middle Silesia north of the Odra river. Here the Germans who arrived during the Middle Ages became mostly Polonized; Germans dominated in large cities and Poles mostly in rural areas. The Polish-speaking territories of Lower and Middle Silesia, commonly described until the end of the 19th century as the Polish side, were mostly Germanized in the 18th and 19th centuries, except for some areas along the northeastern frontier. The province came under the control of Kingdom of Bohemia, in the 14th century. Silesia passed to the Habsburg Monarchy of Austria in 1526, and Prussia's Frederick the Great conquered most of it in 1742. A part of Upper Silesia became part of Poland after World War I, but the bulk of Silesia formed part of the post-1945 "Recovered Territories". The northern territories of Warmia and Masuria form the areas of the former eastern territories of Germany that had been Polish fiefs. Originally inhabited by pagan Old Prussians, these regions became incorporated into the state of the Teutonic Knights in the 13th and 14th centuries. By the Second Peace of Thorn (1466), an area of Warmia around Lidzbark (Heilsberg) was awarded to the Polish crown as part of Royal Prussia, though with considerable autonomy. The remainder of today's Warmia-Masuria region became part of Ducal Prussia, formally a Polish fief. Prussia took direct control of the region in the First Partition of Poland (1772). It formed the southern part of East Prussia after World War I, becoming part of Poland after World War II, with northern East Prussia going to the Soviet Union to form the Kaliningrad Oblast. At the time of the foundation of the German Empire in 1871, the Kingdom of Prussia was the largest and dominant part of the empire. Prussian territory east of the Oder–Neisse line included West Prussia and Posen (taken by Prussia in the first two Partitions of Poland in the 18th century), also Silesia, East Brandenburg, and Pomerania. Later, these territories would come to be called in Germany "Ostgebiete des deutschen Reiches" (Eastern territories of the German Empire). German atlas from 1880 showing the spread of languages. The Treaty of Versailles of 1919 that ended World War I restored the independence of Poland, known as the Second Polish Republic, and Germany was compelled to cede territories to it, most of which were taken by Prussia in the three Partitions of Poland, and had been part of the Kingdom of Prussia and later the German Empire for over 100 years. The territories ceded to Poland in 1919 were those with an apparent Polish majority, such as the Province of Posen, the east-southern part of Upper Silesia and the Polish Corridor. Weimar Germany in 1925. Almost all of the former territories of Germany used to be a part of the historical state of Prussia except for a tiny area around Reichenau in Sachsen (now Bogatynia) that belonged to the historical state of Saxony. In October 1938 Hlučín Area (Hlučínsko in Czech, Hultschiner Ländchen in German) of Moravian-Silesian Region which had been ceded to Czechoslovakia under the Treaty of Versailles was annexed by the Third Reich as a part of areas lost by Czechoslovakia in accordance with the Munich agreement. However, as distinct from other lost Czechoslovakian domains, it was not attached to Sudetengau (administrative region covering Sudetenland) but to Prussia (Upper Silesia). By late 1938, Lithuania had lost control over the situation in the Memel Territory. In the early hours of 23 March 1939, after a political ultimatum caused a Lithuanian delegation to travel to Berlin, the Lithuanian Minister of Foreign Affairs Juozas Urbšys and his German counterpart Joachim von Ribbentrop signed the Treaty of the Cession of the Memel Territory to Germany in exchange for a Lithuanian Free Zone in the port of Memel, using the facilities erected in previous years. Between the two world wars, many in Germany claimed that the territory ceded to Poland in 1919–1922 should be returned to Germany. This claim was one of the justifications for the German invasion of Poland in 1939, heralding the start of the Second World War. The Third Reich annexed the former German lands, comprising the "Polish Corridor", West Prussia, the Province of Posen, and parts of eastern Upper Silesia. The council of the Free City of Danzig voted to become a part of Germany again, although Poles and Jews were deprived of their voting rights and all non-Nazi political parties were banned. In addition to taking territories lost in 1919, Germany also took additional land that had never been German. Katowice District (Regierungsbezirk Kattowitz), or East Upper Silesia (Ost-Oberschlesien), which included Sosnowiec, Będzin, Chrzanów, and Zawiercie Counties, and parts of Olkusz and Żywiec Counties. These territories had an area of 94,000 km2 and a population of 10,000,000 people. The remainder of Polish territory was annexed by the Soviet Union (see Molotov–Ribbentrop Pact) or made into the German-controlled General Government occupation zone. After the German attack on the Soviet Union in June 1941, the district of Białystok, which included the Białystok, Bielsk Podlaski, Grajewo, Łomża, Sokółka, Volkovysk, and Grodno Counties, was "attached to" (not incorporated into) East Prussia, whilst Eastern Galicia (District of Galicia), which included the cities of Lwów, Stanislawów and Tarnopol, was made part of the General Government. The final decision to move Poland's boundary westward was made by the United States, the United Kingdom and the Soviet Union at the Yalta Conference in February 1945, shortly before the end of the war. The precise location of the border was left open; the western Allies also accepted in general the principle of the Oder River as the future western border of Poland and of population transfer as the way to prevent future border disputes. The open question was whether the border should follow the Eastern or Lusatian Neisse rivers, and whether Stettin, the traditional seaport of Berlin, should remain German or be included in Poland. Originally, Germany was to retain Stettin while the Poles were to annex East Prussia with Königsberg. Eventually, however, Stalin decided that he wanted Königsberg as a year-round warm water port for the Soviet Navy and argued that the Poles should receive Stettin instead. The wartime Polish government in exile had little to say in these decisions. At the Yalta Conference, it was agreed to split Germany into four occupation zones after the war, with a quadripartite occupation of Berlin as well, prior to unification of Germany. The status of Poland was discussed, but was complicated by the fact that Poland was at this time under the control of the Red Army. It was agreed to reorganize the Provisionary Polish Government that had been set up by the Red Army through the inclusion of other groups such as the Polish Provisional Government of National Unity and to have democratic elections. This effectively excluded the Polish government-in-exile that had evacuated in 1939. It was agreed that the Polish eastern border would follow the Curzon Line, and Poland would receive substantial territorial compensation in the west from Germany, although the exact border was to be determined at a later time. A "Committee on Dismemberment of Germany" was to be set up. The purpose was to decide whether Germany was to be divided into six nations, and if so, what borders and inter-relationships the new German states were to have. Germany subsequently lost territories east of the Oder–Neisse Line at the end of the War in 1945, when international recognition of its right to jurisdiction over any of these territories was conditionally withdrawn. The "condition" mentioned was the Final German Peace Treaty, which was to set the actual border line, which may or may not have been the Oder–Neisse line. At Potsdam, the assumption by many was that a Final German Peace Treaty was imminent, but this turned out to be incorrect. V. City of Koenigsberg and the adjacent area. The Conference has agreed in principle to the proposal of the Soviet Government concerning the (ultimate) transfer to the Soviet Union of the City of Koenigsberg and the area adjacent to it as described above subject to expert examination of the actual frontier. 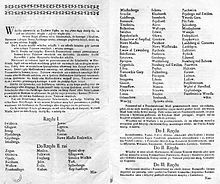 The British and United States Governments have taken measures to protect the interest of the Polish Provisional Government of National Unity as the recognized government of the Polish State in the property belonging to the Polish State located in their territories and under their control, whatever the form of this property may be. In conformity with the agreement on Poland reached at the Crimea Conference the three Heads of Government have sought the opinion of the Polish Provisional Government of National Unity in regard to the accession of territory in the north and west which Poland should receive. The President of the National Council of Poland and members of the Polish Provisional Government of National Unity have been received at the Conference and have fully presented their views. The three Heads of Government reaffirm their opinion that the final delimitation of the western frontier of Poland should await the peace settlement. 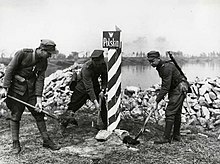 The Three Governments [of the Soviet Union, the United States and Great Britain], having considered the question in all its aspects, recognize that the transfer to Germany of German populations, or elements thereof, remaining in Poland, Czechoslovakia and Hungary, will have to be undertaken. They agree that any transfers that take place should be effected in an orderly and humane manner. Expulsion is the method which, in so far as we have been able to see, will be the most satisfactory and lasting. There will be no mixture of populations to cause endless trouble. A clean sweep will be made. The problem with the status of these territories was that the Potsdam Agreement was not a legally binding treaty, but a memorandum between the USSR, the US and the UK. It regulated the issue of the eastern German border, which was to be the Oder–Neisse line, but the final article of the memorandum said that the final decisions concerning Germany were subject to a separate peace treaty; at which the three Allied signatories committed themselves to respect the terms of the memorandum. Hence, so long as the four Allied Powers remained committed to the Potsdam protocols, without German agreement to the Oder–Neisse line boundary there could be no Peace Treaty and no German Reunification. This treaty was signed in 1990 as the Treaty on the Final Settlement with Respect to Germany. After the War, the so-called "German question" was an important factor of post-war German and European history and politics. The debate affected Cold War politics and diplomacy and played an important role in the negotiations leading up to the reunification of Germany in 1990. In 1990 Germany officially recognized its present eastern border at the time of its reunification in the Treaty on the Final Settlement with Respect to Germany, ending any residual claims to sovereignty that Germany may have had over any territory east of the Oder–Neisse line. Between 1945 and 1990 the government of West Germany referred to these territories as "former German territories temporarily under Polish and Soviet administration". This terminology was used in relation to territories of eastern Germany within the 1937 Germany border, and was based on the terminology used in the Potsdam Agreement. It was used only by the Federal Republic of Germany; but the Polish and Soviet governments objected to the obvious implication that these territories should someday revert to Germany. The Polish government preferred to use the phrase "Recovered Territories", asserting a sort of continuity because parts of these territories had centuries previously been ruled by ethnic Poles. With the rapid advance of the Red Army in the winter of 1944–1945, German authorities desperately evacuated many Germans to west of the Oder–Neisse line. The majority of the remaining German-speaking population east of the Oder–Neisse line (roughly 10 million in the ostgebiete alone) that had not already been evacuated was expelled. Although in the post-war period earlier German sources often cited the number of evacuated and expelled Germans at 16 million and the death toll at between 1.7 and 2.5 million, today, the numbers are considered by some historians to be exaggerated and more likely in the range between 400,000 and 600,000. Some present-day estimates place the numbers of German refugees at 14 million of which about half a million died during the evacuations and expulsions. At the same time, Poles from central Poland, expelled Poles from former eastern Poland, Polish returnees from internment and forced labour, Ukrainians forcibly resettled in Operation Vistula, and Jewish Holocaust survivors were settled in German territories gained by Poland, whereas the north of former East Prussia (Kaliningrad Oblast gained by the USSR) was turned into a military zone and subsequently settled with Russians. In the 1970s, West Germany adopted Ostpolitik in foreign relations, which strove to normalise relations with its neighbours by recognising the realities of the European order of the time, and abandoning elements of the Hallstein Doctrine. West Germany "abandoned, at least for the time being, its claims with respect to German self-determination and reunification, recognising de facto the existence of the German Democratic Republic (GDR) and the Oder–Neisse line." As part of this new approach, West Germany concluded friendship treaties with the Soviet Union (Treaty of Moscow (1970)), Poland (Treaty of Warsaw (1970)), East Germany (Basic Treaty (1972)) and Czechoslovakia (Treaty of Prague (1973)). 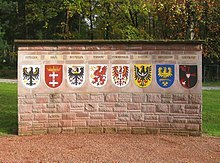 Expellee memorial, showing the coat of arms of East Prussia, Danzig, West Prussia, Pomerania, Brandenburg (for East Brandenburg), Silesia, Upper Silesia, and the (originally Austrian) Sudetenland. Posen is not included. Historically, these coat of arms did not all exist at the same time. The passage of time resulted in fewer people being left who have firsthand experience of living in these regions under German jurisdiction. In the Treaty on the Final Settlement With Respect to Germany, Germany renounced all claims to territory east of the Oder–Neisse line. Germany's recognition of the border was repeated in the German–Polish Border Treaty on November 14, 1990. The treaties were made by both German states and ratified in 1991 by a united Germany. The expansion of the European Union towards east in 2004 enabled any German wishing to live and work in Poland, and thus east of the Oder–Neisse line, to do so without requiring a permit. German expellees and refugees became free to visit their former homes and set up residence, though some restrictions remained on the purchase of land and buildings. Poland entered the Schengen Area on December 21, 2007, removing all border controls on its border with Germany. Under Article 1 of the Treaty on Final Settlement, the new united, Germany committed itself to renouncing any further territorial claims beyond the boundaries of East Germany, West Germany and Berlin; "The united Germany has no territorial claims whatsoever against other states and shall not assert any in the future." Furthermore, the Basic Law of the Federal Republic was required to be amended to state explicitly that full German unification had now been achieved, such that the new German state comprised the entirety of Germany, and that all constitutional mechanisms should be removed by which any territories outside those boundaries could otherwise subsequently to be admitted; these new constitutional articles being bound by treaty not to be revoked. Article 23 of the Basic Law was repealed, closing off the possibility for any further states to apply for membership of the Federal Republic; while Article 146 was amended to state explicitly that the territory of the newly unified republic comprised the entirety of the German people; "This Basic Law, which since the achievement of the unity and freedom of Germany applies to the entire German people, shall cease to apply on the day on which a constitution freely adopted by the German people takes effect". This was confirmed in the 1990 rewording of the preamble; "Germans..have achieved the unity and freedom of Germany in free self-determination. This Basic Law thus applies to the entire German people." In place of the former Article 23 (under which the states of East Germany had been admitted), a new Article 23 established the constitutional status of accession of the Federal Republic to the European Union; hence with the subsequent accession of Poland to the EU, the constitutional bar on pursuing any claim to territories beyond the Oder–Neisse Line was reinforced. In so far as the former German Reich may be claimed to continue in existence within 'Germany as a whole', former eastern German territories in Poland and Russia are now definitively and permanently excluded from ever again being united with Germany. In the course of the German reunification, Chancellor Helmut Kohl accepted the territorial changes made after World War II, creating some outrage among the Federation of Expellees, while some Poles were concerned about a possible revival of their 1939 trauma through a "second German invasion", this time with the Germans buying back their land, which was cheaply available at the time. This happened on a smaller scale than many Poles expected, and the Baltic Sea coast of Poland has become a popular German tourist destination. The so-called "homesickness-tourism" which was often perceived as quite aggressive well into the 1990s now tends to be viewed as a good-natured nostalgia tour rather than an expression of anger and desire for the return of the lost territories. Some organisations in Germany continue to claim the territories for Germany or property there for German citizens. The Prussian Trust (or the Prussian Claims Society), that probably has less than a hundred members, re-opened the old dispute when in December 2006, it submitted 23 individual claims against the Polish government to the European Court of Human Rights asking for compensation or return of property appropriated from its members at the end of World War II. An expert report jointly commissioned by the German and Polish governments from specialists in international law have confirmed that the proposed complaints by the Prussian Trust had little hope of success. But the German government cannot prevent such requests being made and the Polish government has felt that the submissions warranted a comment by Anna Fotyga, the Polish Minister of the Foreign Affairs to "express [her] deepest concern upon receiving the information about a claim against Poland submitted by the Prussian Trust to the European Court of Human Rights". On 9 October 2008 the European Court of Human Rights declared the case of Preussische Treuhand v. Poland inadmissible, because the European Convention on Human Rights does not impose any obligations on the Contracting States to return property which was transferred to them before they ratified the Convention. After the National Democratic Party of Germany, described as a neo-Nazi organisation, won six seats in the parliament of Mecklenburg-Vorpommern in September 2006, the leader of the party, Udo Voigt, declared that his party demands Germany in "historical borders" and questioned the current border treaties. Important events from German history include battles such as Frederick the Great’s victories at Mollwitz in 1741, Hohenfriedeberg in 1745, Leuthen (1757) and Zorndorf (1758), and his defeats at Gross-Jägersdorf in 1757 and Kunersdorf in 1759. Historian Norman Davies describes Kunersdorf as "Prussia's greatest disaster" and the inspiration for Christian Tiedge's Elegy to "Humanity butchered by Delusion on the Altar of Blood". In the Napoleonic Wars the Pomeranian town of Kolberg was besieged in 1807 (inspiring a Second World War Nazi propaganda film) while the French Grande Armée was victorious at Eylau in East Prussia in the same year. The Treaties of Tilsit were separately signed in the selfsame town in July 1807 between Napoleon and the Russians and Prussians. The Iron Cross, Germany's highest military honour, was established (though not awarded) by King Frederick William III at Breslau on 17 March 1813. In World War I, Hindenburg won critical victories at Tannenberg and the Masurian Lakes, ejecting Russian forces from East Prussia. ^ Poland received several cities and counties of West Prussia located east of the Vistula: Lubawa, Brodnica, Wąbrzeźno, Toruń, Chełmno, Grudziądz; as well as most of cities and counties of West Prussia located west of it: Świecie, Tuchola, Starogard Gdański, Kwidzyn (only part west of the Vistula), most of county Tczew, eastern part of county Złotów, part of county Człuchów, as well as counties Chojnice, Kościerzyna, Kartuzy, coastal Wejherowo and Puck with Gdynia; as well as a small western part of Danziger Höhe and areas around Janowo east of the Vistula. ^ Parts of West Prussia east of Nogat and Vistula rivers which remained in Germany after 1918, including the city and county of Elbląg and counties Malbork (part east of Nogat), Sztum, Kwidzyn (only part east of the Vistula) and Susz were incorporated to East Prussia as the Regency of West Prussia. The area of historical Pomesania had significant Polish minority. ^ Western part of West Prussia with county Wałcz and parts of counties Złotów and Człuchów (the latter two split between Poland and Germany). This area included 12 towns and cities: Człuchów, Debrzno, Biały Bór, Czarne, Lędyczek, Złotów, Krajenka, Wałcz, Mirosławiec, Człopa, Tuczno and Jastrowie. The area was home to significant Polish minority. ^ Part of pre-1918 county Nidzica with Działdowo and with over 24 thousand inhabitants; as well as parts of county Ostróda near Dąbrówno, with areas around Groszki, Lubstynek, Napromek, Czerlin, Lewałd Wielki, Grzybiny and with around 4786 inhabitants. Too small to form its own voivodeship, this territory was incorporated to intewar Pomeranian Voivodeship. 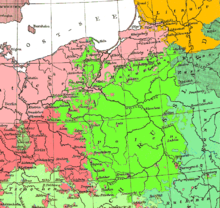 ^ Western fringes of Prussian Greater Poland, which remained in Germany after 1918. This area included entire county Skwierzyna as well as portions of counties Wschowa, Babimost, Międzyrzecz, Chodzież, Wieleń and Czarnków (Netzekreis). It contained 12 towns and cities: Piła, Skwierzyna, Bledzew, Wschowa, Szlichtyngowa, Babimost, Kargowa, Międzyrzecz, Zbąszyń, Brójce, Trzciel and Trzcianka. The area was home to significant Polish minority. ^ After World War 1 Poland received a small part of historical Lower Silesia, with majority ethnic Polish population as of year 1918. That area included parts of counties Syców (German: Polnisch Wartenberg), Namysłów, Góra and Milicz. In total around 512 square kilometers with around 30 thousand inhabitants, including the city of Rychtal. Too small to form its own voivodeship, the area was incorporated to Poznań Voivodeship (former Province of Posen). ^ Interwar Silesian Voivodeship was formed from Prussian East Upper Silesia (area 3,225 km2) and Polish part of Austrian Cieszyn Silesia (1,010 km2), in total 4,235 km2. After the annexation of Zaolzie from Czechoslovakia in 1938, it increased to 5,122 km2. Silesian Voivodeship's capital was Katowice. ^ All in all, the post-Prussian part of Poland had ca. 4 million inhabitants immediately after the Great War - ca. 2 million from Province of Posen, ca. 1 million from West Prussia and ca. 1 million from Upper Silesia, plus 60,000 from Lower Silesia and East Prussia. ^ Kozicki, Stanislas (1918). The Poles under Prussian rule. Toronto: London, Polish Press Bur. ^ see for example msn encarta Archived 2009-10-31 at WebCite: "diejenigen Gebiete des Deutschen Reiches innerhalb der deutschen Grenzen von 1937", Meyers Lexikon online Archived 2009-01-26 at the Wayback Machine: "die Teile des ehemaligen deutschen Reichsgebietes zwischen der Oder-Neiße-Linie im Westen und der Reichsgrenze von 1937 im Osten". Archived 2009-10-31. ^ The problem with the status of these territories was that in 1945 the concluding document of the Potsdam Conference was not a legally binding treaty, but a memorandum between the USSR, the US and the UK. It regulated the issue of the eastern German border, which was to be the Oder–Neisse line, but the final article of the memorandum said that the final decisions concerning Germany were subject to a separate peace treaty. This treaty was signed in 1990 under the name of Treaty on the Final Settlement by both the German states and ratified in 1991 by the united Germany. This ended the legal limbo state which meant that for 45 years, people on both sides of the border could not be sure whether the settlement reached in 1945 might be changed at some future date. ^ The public broadcaster run by the states of Saxony, Saxony-Anhalt, and Thuringia is Mitteldeutscher Rundfunk (lit. in English: Middle German broadcast), the regional newspaper issued in Halle upon Saale is the Mitteldeutsche Zeitung, and a Protestant regional church body in the area, just recently founded by a merger, is the Evangelische Kirche in Mitteldeutschland (English: Protestant Church in Middle Germany). ^ "Śląska Biblioteka Cyfrowa - biblioteka cyfrowa regionu śląskiego - Wznowione powszechne taxae-stolae sporządzenie, Dla samowładnego Xięstwa Sląska, Podług ktorego tak Auszpurskiey Konfessyi iak Katoliccy Fararze, Kaznodzieie i Kuratusowie Zachowywać się powinni. Sub Dato z Berlina, d. 8. Augusti 1750". Sbc.org.pl. Retrieved 2013-11-20. ^ a b c d e f g h i j Weinfeld, Ignacy (1925). Tablice statystyczne Polski: wydanie za rok 1924 [Poland's statistical tables: edition for year 1924]. Warsaw: Instytut Wydawniczy "Bibljoteka Polska". p. 2. ^ a b c d Nadobnik, Marcin (1921). "Obszar i ludność b. dzielnicy pruskiej [Area and population of former Prussian district]" (PDF). Ruch Prawniczy, Ekonomiczny i Socjologiczny. Poznań. 1(3) – via AMUR - Adam Mickiewicz University Repository. ^ a b "Die Grenzmark Posen-Westpreußen Übersichtskarte". Gonschior.de. ^ a b "Gemeindeverzeichnis Deutschland". ^ Jehke, Rolf. "Rbz. Allenstein: 10.1.1920 Abtretung des Kreises Neidenburg (teilweise) an Polen; 15.8.1920 Abtretung der Landgemeinden Groschken, Groß Lehwalde (teilweise), Klein Lobenstein (teilweise), Gut Nappern und der Gutsbezirke Groß Grieben (teilweise) und Klein Nappern (teilweise) an Polen". territorial.de. ^ "Działdowo, Soldauer Gebiet, Soldauer Ländchen". GOV The Historic Gazetteer. ^ Khan, Daniel-Erasmus (2004). Die deutschen Staatsgrenzen. Tübingen: Mohr Siebeck. p. 78. ISBN 3-16-148403-7. ^ a b "Gemeindeverzeichnis Deutschland: Schlesien". ^ "Schlesien: Geschichte im 20. Jahrhundert". OME-Lexikon - Universität Oldenburg. ^ Sperling, Gotthard Hermann (1932). "Aus Niederschlesiens Ostmark" (PDF). Opolska Biblioteka Cyfrowa. ^ Mały Rocznik Statystyczny [Little Statistical Yearbook] 1939 (PDF). Warsaw: GUS. 1939. p. 14. ^ Osmańczyk, Edmund Jan (2003). "Potsdam Agreement, 1945". In Mango, Anthony (ed.). Encyclopedia of the United Nations and International Agreements: A to F. 1. Taylor & Francis. pp. 1829–1830. ISBN 9780415939218. ^ Krickus, Richard J. (202). The Kaliningrad Question (illustrated ed.). Rowman & Littlefield. pp. 34–35. ISBN 9780742517059. ^ Piotrowicz, Ryszard W.; Blay, Sam; Schuster, Gunnar; Zimmermann, Andreas (1997). "The Unification of Germany in International and Domestic Law". German monitor. Rodopi (39): 48–49. ISBN 9789051837551. ISSN 0927-1910. ^ Murphy, Clare (2004-08-02). "WWII expulsions spectre lives on". BBC News. bbc.co.uk. Retrieved 25 January 2017. ^ Junker, Detlef; Gassert, Philipp; Mausbach, Wilfried; et al., eds. (2004). The United States and Germany in the Era of the Cold War, 1945-1990: A Handbook. Publications of the German Historical Institute Volume 1 of The United States and Germany in the Era of the Cold War 2 Volume Set (illustrated ed.). Cambridge University Press. p. 105. ISBN 9780521791120. ^ Piotrowicz et al. 1997, p. 66. ^ Hans-Ulrich Wehler (2003). Deutsche Gesellschaftsgeschichte Band 4: Vom Beginn des Ersten Weltkrieges bis zur Gründung der beiden deutschen Staaten 1914–1949 (in German). Munich: C.H. Beck Verlag. ISBN 3-406-32264-6. ^ Dagmar Barnouw (2005). The War in the Empty Air: Victims, Perpetrators, and Postwar Germans. Bloomington: Indiana University Press. p. 143. ISBN 0-253-34651-7. ^ a b Frank Biess (2006). "Review of Dagmar Barnouw, The War in the Empty Air: Victims, Perpetrators, and Postwar Germans". H-Net Reviews: 2. Archived from the original (pdf) on 2006-09-02. Retrieved 2006-08-15. ^ Rüdiger Overmans (2004). Deutsche militärische Verluste im Zweiten Weltkrieg (German Military Losses in WWII) (in German). Munich: Oldenbourg. pp. 298–300. ISBN 3-486-56531-1. ^ a b Davies, N. (2005) God's Playground. A History of Poland. Volume II: 1795 to the present. Oxford: Oxford University Press. ^ Michael Nungesser. Das Denkmal auf dem Kreuzberg von Karl Friedrich Schinkel, ed. on behalf of the Bezirksamt Kreuzberg von Berlin as catalogue of the exhibition „Das Denkmal auf dem Kreuzberg von Karl Friedrich Schinkel" in the Kunstamt Kreuzberg / Künstlerhaus Bethanien Berlin, between 25 April and 7 June 1987, Berlin: Arenhövel, 1987, p. 29. ISBN 3-922912-19-2. Ryszard W. Piotrowicz. The Status of Germany in International Law: Deutschland uber Deutschland? The International and Comparative Law Quarterly, Vol. 38, No. 3 (Jul., 1989), pp. 609–635 "The purpose of this article is to consider the legal status of Germany from 1945 to "